We are committed to the open dissemination of scholarly information to a global audience. Through our journal publishing program the Libraries provide services and software for Boston College faculty, staff, and students who want to publish an online open access journal. Journals are published using Open Journal Systems (OJS) software, an open source management and publishing system. OJS provides a professional online presence and assists with every stage of the journal publishing process—submissions, peer review, online publication, and indexing. We customize the journal appearance, provide initial training to editorial staff and provide ongoing technical support. Articles are licensed for reuse using a Creative Commons license. We also offer authors the opportunity to deposit data accompanying their article in our Boston College Dataverse repository and to make it openly available there. For more information, see Open Access and Scholarly Publishing, and Publishing with OJS at BC. Contact Sarah Melton, Head of Digital Scholarship, with questions. Boston College's undergraduate political science journal serves as a forum to promote academic dialogue and exchange both within and outside of the University's political science community and also expands upon the current offerings of the major. Dianoia fosters open philosophical discussion and writing among undergraduate students. The journal is committed to providing the opportunity for intellectual reflection which bridges the academic disciplines in pursuit of holistic understanding. Elements, the biannual undergraduate research journal, showcases original research completed by Boston College students in any discipline. By fostering intellectual curiosity and discussion, the journal strengthens and affirms the community of undergraduate students at Boston College. Information Technology and Libraries publishes material related to all aspects of libraries and information technology, from digital libraries, to GIS, to digital humanities, and much more. 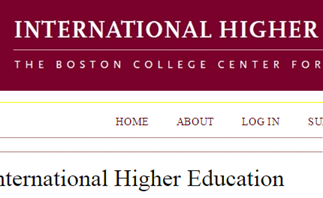 IHE publishes insightful, informed, and high-quality commentary and analysis on trends and issues of importance to higher education systems, institutions, and stakeholders around the world. A peer-reviewed journal that aims to advance knowledge and promote research, as well as provide a forum for policy discussion and analysis on diverse higher education issues in the African continent. The Journal of Marketing Communications for Higher Education is devoted to scholarship and commentary on the use of branding and contemporary marketing and communications strategies within higher education. The objective is to advance the study of marketing and communications with current literature based on theory, research and practice. Boston College’s flagship Middle East Studies journal proposes a study of the Near East from a broad, diverse, and inclusive purview, with the hope of bringing into focus the larger conceptual, geographic, social, linguistic, and cultural settings of the region. A student-run journal showcasing original research papers, book reviews, and other works of interest by both graduate and undergraduate students in topics related to Linguistics and the study of language. Lumen et Vita, meaning “Light and Life,” is the graduate journal of Boston College’s School of Theology and Ministry. Proceedings of The Catholic Theological Society of America Annual Convention. A peer-reviewed graduate journal of literary and cultural criticism, published by the Department of Romance Languages & Literatures at BC. Romance eReview creates a common venue of intellectual exchange for the Spanish, French and Italian sections of our department and provides our students with first-hand editorial experience. Published by the Center for Christian-Jewish Learning at Boston College, the Journal publishes peer-reviewed scholarship on the history, theology, and contemporary realities of Jewish-Christian relations and reviews new materials in the field. Studies is a product of the Seminar on Jesuit Spirituality. The Seminar studies topics pertaining to the spiritual doctrine and practice of Jesuits, especially American Jesuits, and gathers current scholarly studies pertaining to the history and ministries of Jesuits throughout the world.